There are moments when our day to day secular lives collide with the Jewish calendar – moments when the intersection of our identity as Americans and our identity as Jews overlap in wonderful ways. To me, Passover is one of those moments. Sociologists say that more Jews observe Passover, however one defines that, than come to synagogue for Yom Kippur – a remarkable commentary on the power of this holiday. Why is that, I wonder? I believe that the short answer to that question is: family. Some of us will have the opportunity to be with our actual blood relatives during this time, and many appreciate that Passover provides an opportunity to be with our families in this sacred season. Others whose families are far away, and still others whose family has grown small, gather with friends who feel like family during this time. But whether or not you have the opportunity to be with your relatives during this time, I think what unites us about the Passover story is that it is our family story. On this page in the Moss Haggadah is an elaborate grid with rows of circles. Every other circle has drawings of Jews throughout the ages. There’s an Egyptian-looking Jew, a Jew dressed in medieval garb, a Jew that looks like she lived in Mozart’s Europe, and another that looks like a man from colonial America. Jews have lived in every place and every time, the page seems to be saying. But that’s not even the most beautiful part. 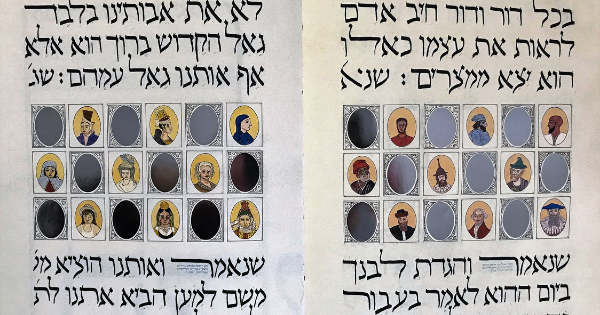 What I find most moving on the page is that, in between each picture of a Jew from each different age, is a tiny oval mirror, so that we might see ourselves in the reflection – that we might actually see ourselves in the stories of each of these Jews, going back to Egypt. That’s the ultimate reason, I think, why we keep coming back to the same story, every year. That’s why we agree to eat the same fantastic brisket or the same so-so matzah balls. That’s why we are willing to listen to our uncle’s same bad jokes and have the same political argument with that same cousin who has had more than her share of Manischewitz. This is the story of our family – our Jewish family. And we like knowing that we have family, whether they live down the street, across the world, or through history. We are not alone. From Elyssa, Ari, Lev, and I, we wish you a zissen Pesach – a sweet and meaningful holiday. Thanks for letting us be a part of your family.